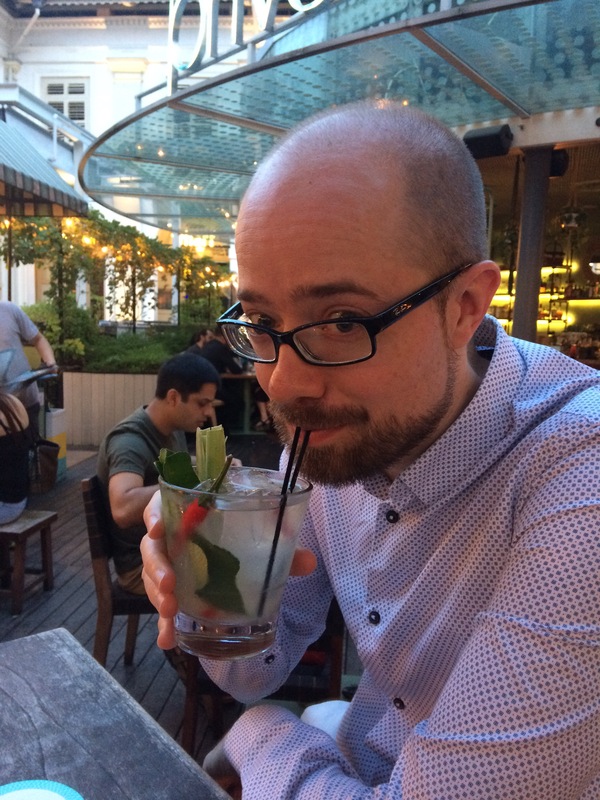 On this occasion, the reason we found ourselves in Singapore was because I had been invited to speak at a conference in Yogyakarta, Indonesia – it seemed like an excellent place to break the journey, and if cocktails were involved so much the better. We spent an evening and full day there on the way out, and then most of a day on the way back, and this worked very well indeed, giving us enough time to see most of the sights we were interested in. Landing in Singapore after a 12 hour flight from Zurich, we were struck by how very fancy the airport was – it bears a strong resemblance to one of the better Vegas hotels, with jazzy carpeting, bright lighting, and high-end boutiques and cafes around every corner. Immigration and baggage collection were a breeze, and after a brief stop to change some money we were on the MRT heading into the city (appreciating that it’s cleaner, more spacious and, I think, cheaper than its counterparts in New York and London). After checking into our hotel we walked over to the bay area, and enjoyed wandering around the waterfront, admiring the lights and trying to avoid a huge number of runners participating in a Star Wars themed fun run (it was May 4th, after all). 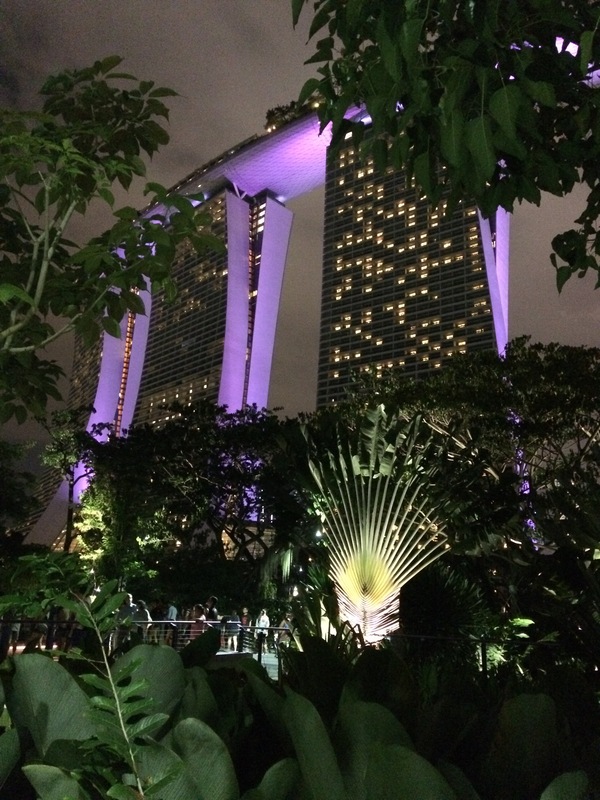 The Gardens by the Bay and Marina Sands hotel were fun to admire in the dark, and it felt very appropriate viewing them with Star Wars music playing in the background – all it needed to complete the ambience was a few x-wings zooming about (although some bats were doing their best). Our main sightseeing day was largely taken up by a fairly comprehensive walking tour which Tom had constructed from several different routes suggested by our guidebook. Fueled by an epic breakfast at the hotel buffet, we caught the MRT to Chinatown and immediately got caught in a rain shower (with our three umbrellas back at the hotel). 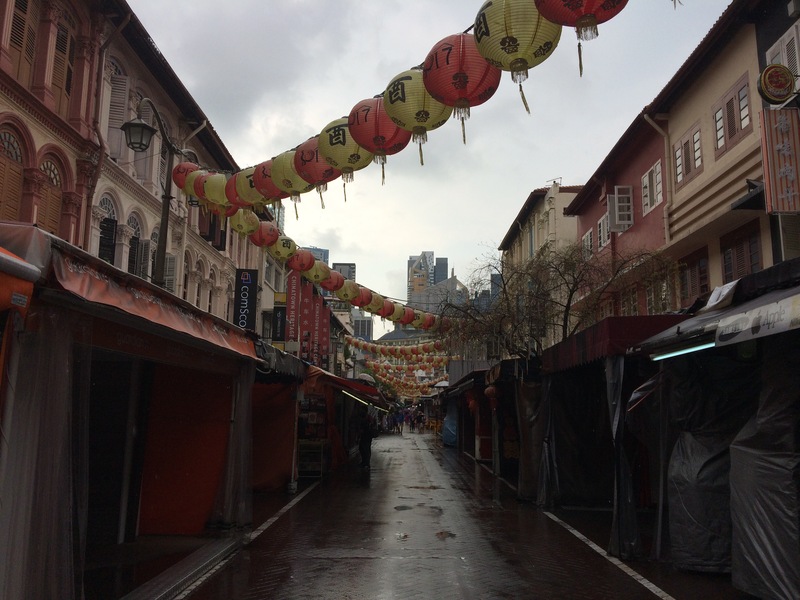 Then it was on past Raffles to Kampong Glam and Little India, before another MRT journey to the botanic gardens and a wander through the orchid collection. By this point we were warm and weary, so after a quick stop for some food at the Lau Pa Sat hawker market we headed back to the hotel for a nap and a swim. The evening plan was to have a cocktail at Raffles before dinner, but this was thwarted by a private event inconsiderately having booked the hotel bar, so we consoled ourselves with drinks at Chijmes across the street instead. A week later we were back in Singapore, with plans to finally get a drink at Raffles and for another dinner at ODP before our flights home. Having gratefully deposited our suitcases at the airport’s left luggage office, our first stop was the National Museum of Singapore – it was early afternoon and we needed something to do before the cocktail hour. This was an excellent museum, and we spent a very enjoyable couple of hours perambulating through the permanent collection and some of the temporary exhibits. 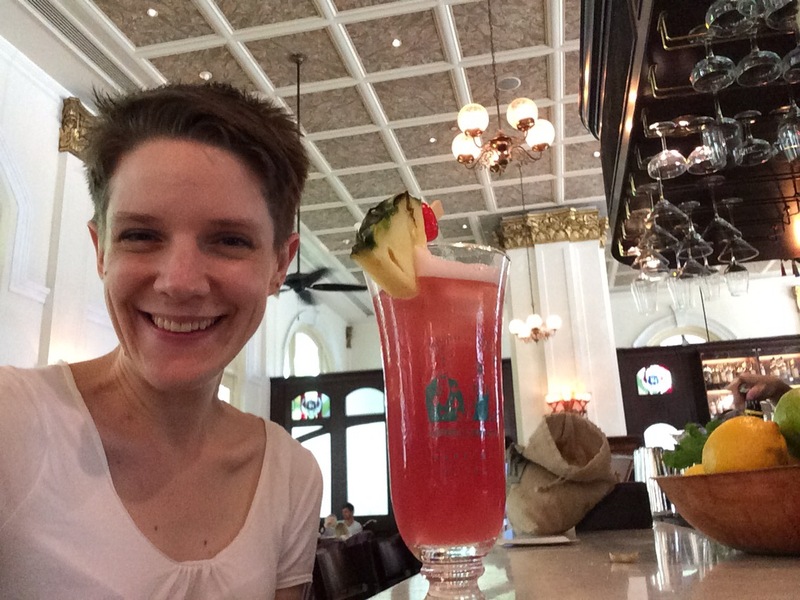 Then, at long last, it was time for a Singapore Sling at Raffles. 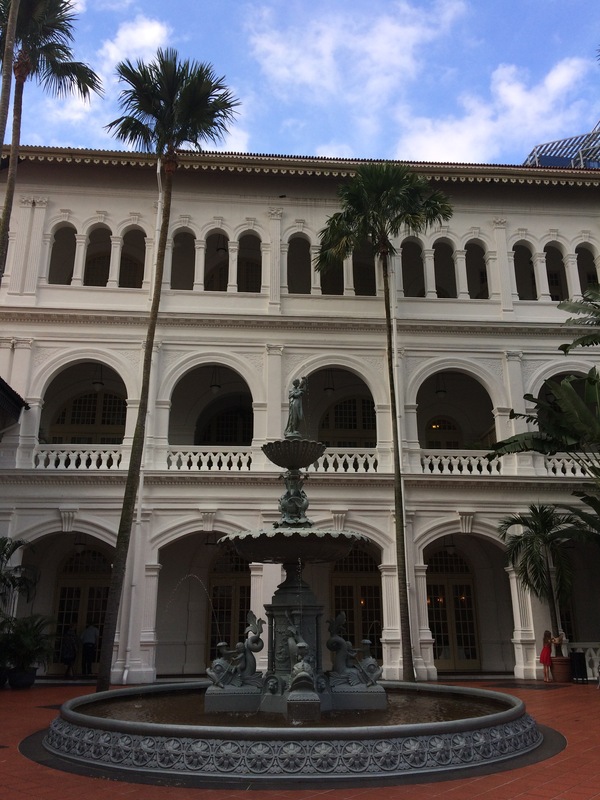 Rather sadly, the Long Bar is currently undergoing restoration, so we had to drink in a different bar, but we were still at Raffles and that was enough for me. I know some people don’t like the Sling very much (Tom included, he went for something different) but I genuinely enjoy them from time to time, and it was a delightful way to spend the last afternoon of our holiday. 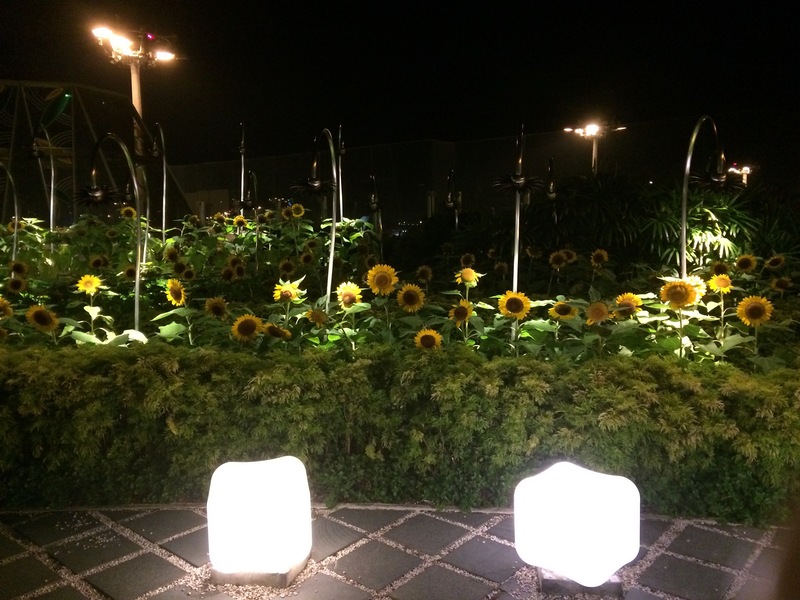 Dinner did not disappoint either, and we were back at the airport with time to admire some of the gardens (yes, actual gardens, both inside and out, with a koi carp pool for good measure) and shop for a few final souvenirs before heading to our gate. 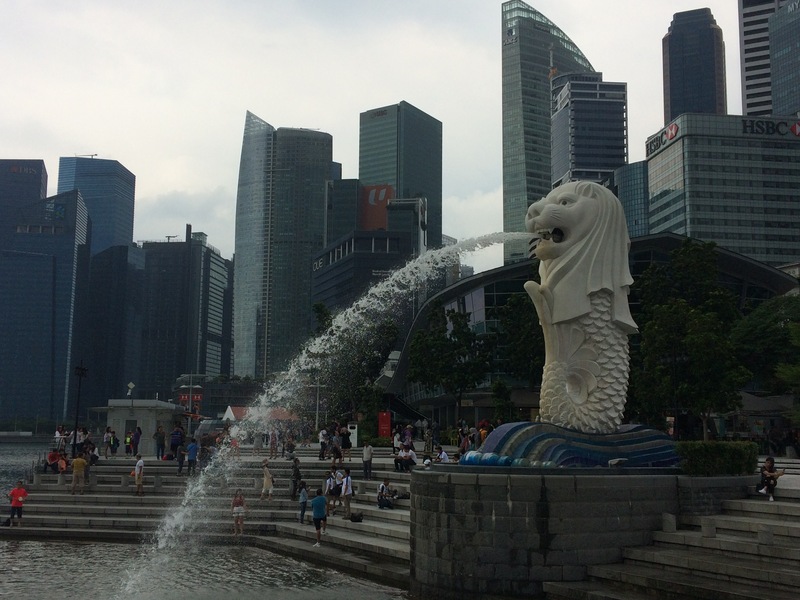 Overall, we really liked Singapore. 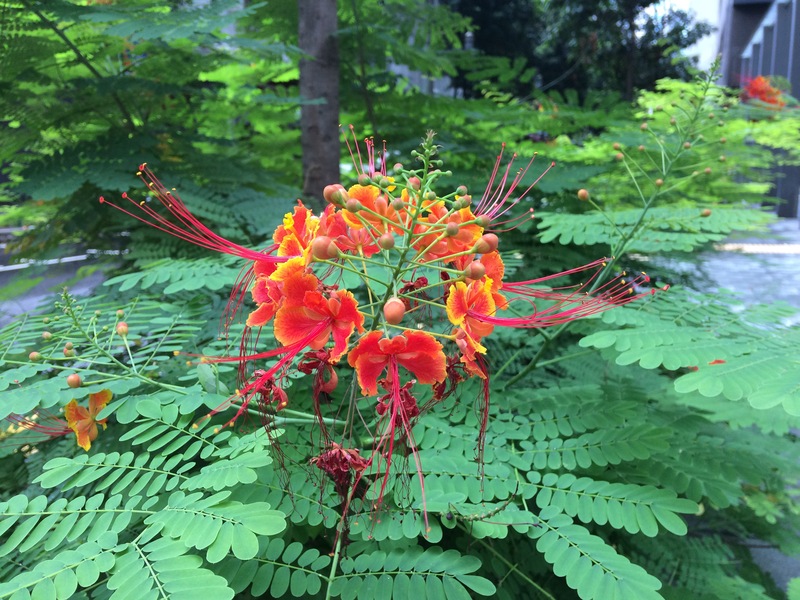 Despite the humidity, I think it would be a very easy place to live (not that we’re planning a move any time soon, but it’s good to keep these things in mind), and of course is an excellent jumping-off point for explorations around Asia. 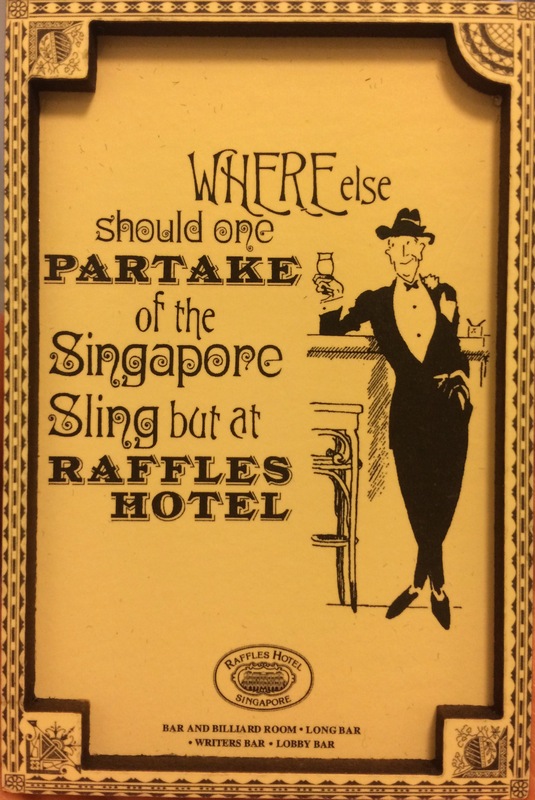 Our visit to Raffles was immortalised by one of the more expensive fridge magnets in our collection, and I would be very happy to return there too as it looked like a beautiful hotel to stay in – better start saving now…! As ever there are FAR too many photos from the whole Singapore/Indonesia trip in my Flickr album – it’s possible I’ll get around to editing them one day, but meanwhile click here if you’d like to take a look at the Singapore subset. 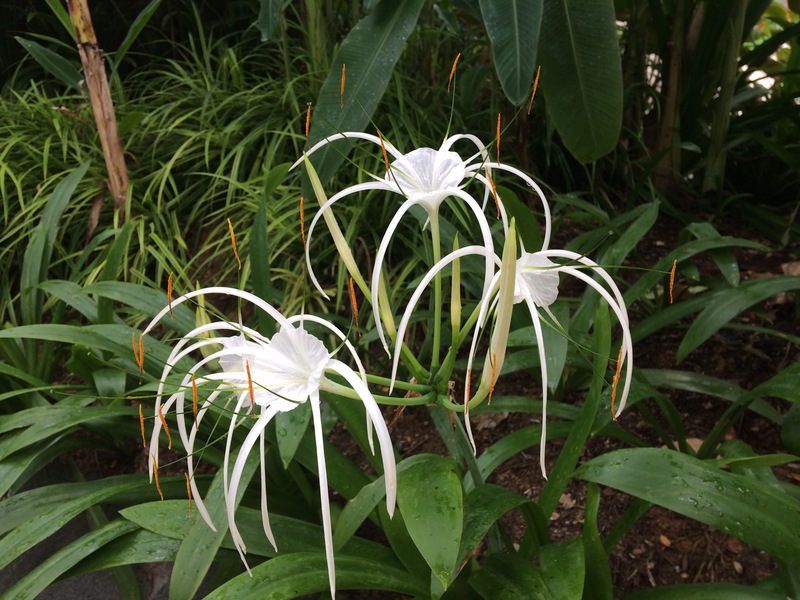 This entry was posted in Exploring, Food and drink, Museums/galleries, Travel and tagged Changi airport, Chijmes, cocktails, Gardens by the Bay, merlion, Raffles hotel, Singapore Sling by Emma Davidson. Bookmark the permalink.